I love it when I have an idea that turns out as crochet blanket as I had pictured. I’m not going to lie: I almost frogged this blanket in its early stages because I wasn’t sure if it would end up how I had envisioned. I’m so thankful that I decided to run with it, though, because I absolutely love the finished product. 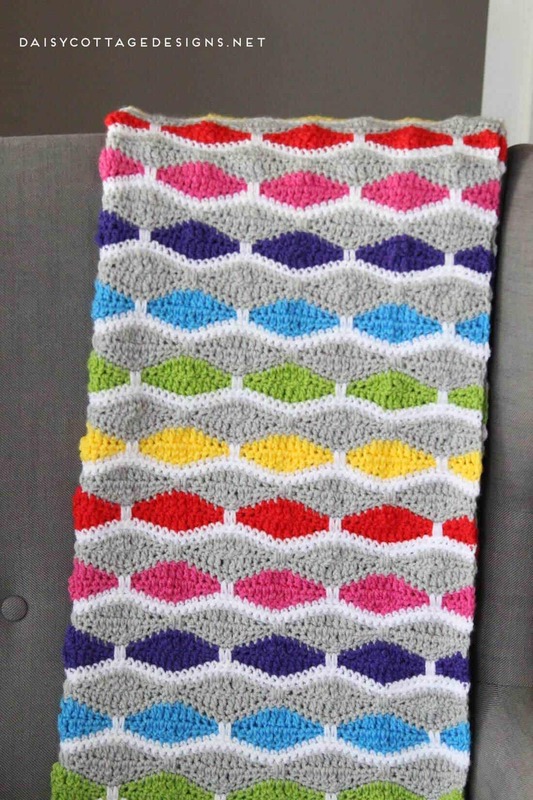 The bright colors and the white make this blanket pop. It screams fun and looks gorgeous draped across my favorite chair. 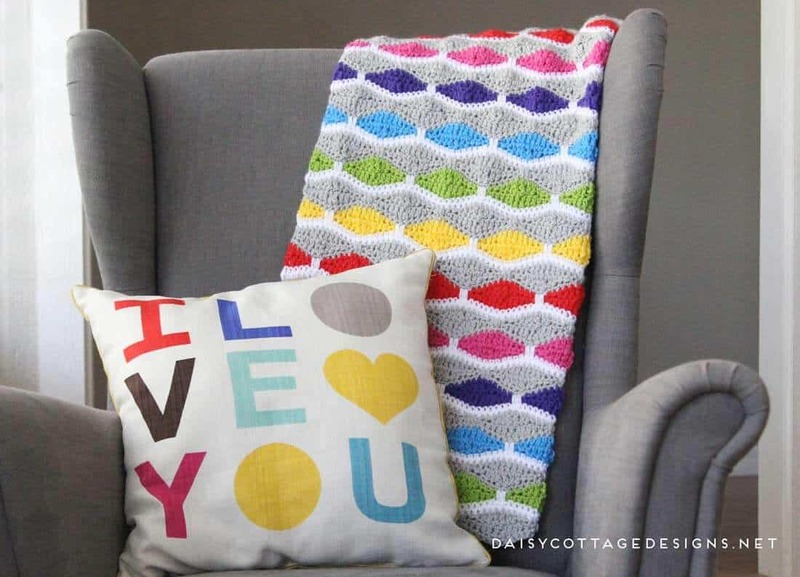 Check out all the other free crochet patterns from Daisy Cottage Designs! 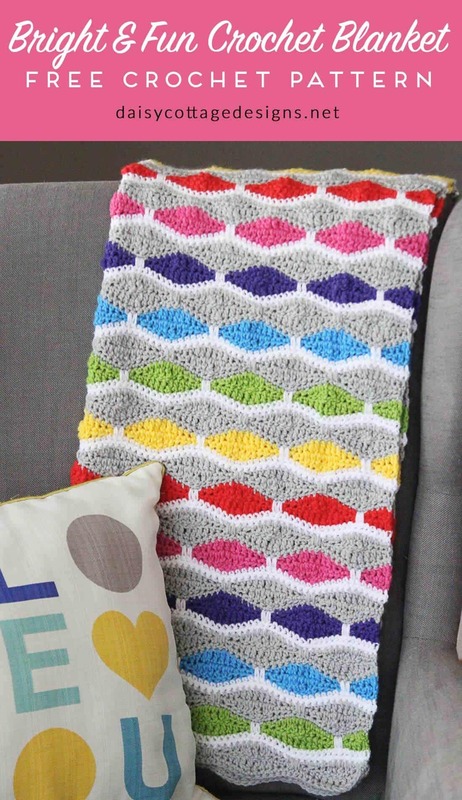 Even thought this blanket has some elements that might seem tough at first glance, this crochet blanket is not hard to make. That said, if this is the first time you’ve tried to make a crochet blanket pattern, you might want to test a small swatch first. I’ll give you the directions for that below. In fact, you’ll be able to make this into a crochet baby blanket or into an afghan for your king-sized bed. 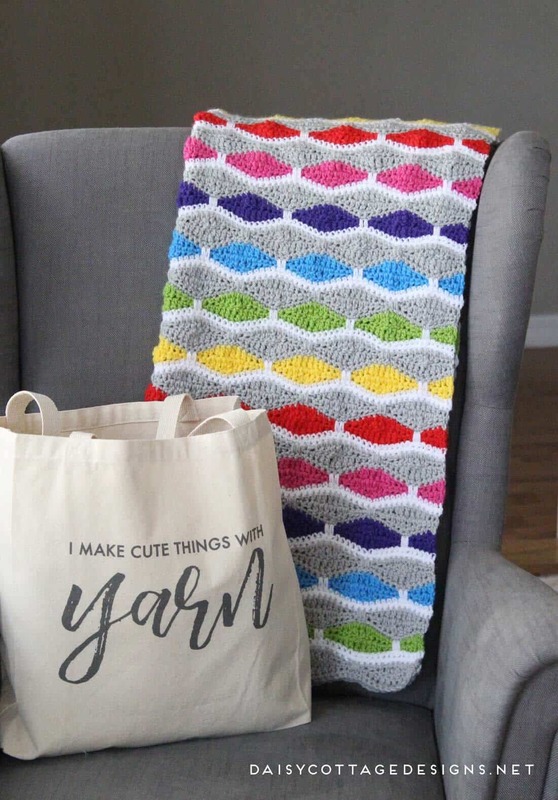 You can make this blanket any size you want! And, let’s take a time out for a second… How cute is that tote bag?! If you want to snag one, you can grab one here for $10.50! I have already loved using mine. 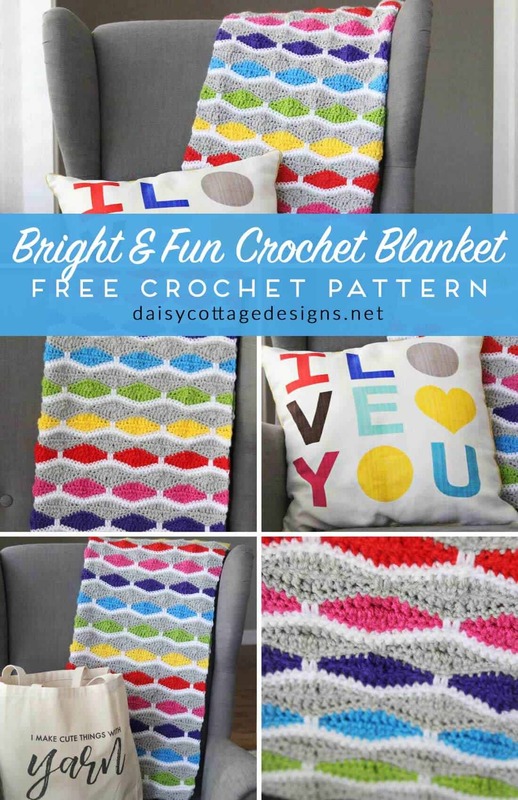 If you want to give this crochet blanket pattern a try, the instructions are below. I’m hoping to do a video in the near future, but I wanted to get it up there for those of you who are experienced crocheters and/or do well with written patterns. For those of you (I’m raising my hand here) who like videos, I’m going to try my best to get it done this week. Please do understand that I’m the busy mom of three little girls, though… so if it takes a little longer, that’s why. Worsted weight yarn in the following colors in Hobby Lobby’s I Love This Yarn! 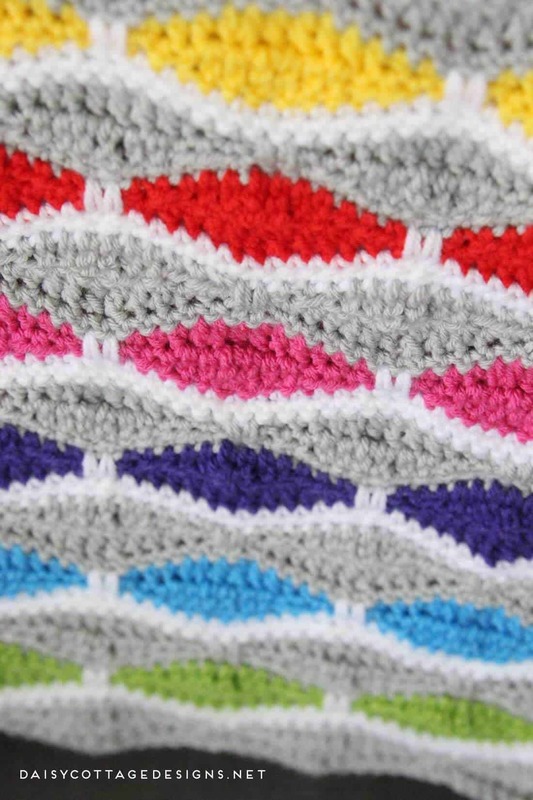 Numbers in parentheses indicate how many to purchase in order to make a 30” square blanket. As you’re working, you’ll want to tug on the tops of your peaks on each row. This pattern has a slight tendency to pucker a little bit, but that can be minimized greatly by doing this. After you’re finished with the blanket, smoothing it out on a flat surface and steaming it can help. Do NOT touch your iron to acrylic yarn. It will melt it. Begin with your gray yarn. Chain a multiple of 14+13. To make this the same size that I made (approximately 30” square), chain 111. To work a swatch, chain 27.
sc in the second chain from hook and in each stitch across. Rows 2-3: Ch 1, turn. sc in the first st. *hdc in the next 2 stitches, dc in the next 2 stitches, tr in the next two stitches, dc in the next 2 stitches, hdc in the next 2 stitches, sc in the next st, ch 2, skip the next 2 stitches, sc in the next st* across. Your last sequence will not have the ch 2 and sc at the end. Row 4: Ch 1, turn. sc in the first 12 stitches. *working over the ch-2 spaces, dc in each of the next 2 stitches 3 rows below, sc in each of the next 12 stitches. * across. NOTE: When you’re working over the chains, insert your hook into the unworked stitches on the last single crochet row you made. Rows 5 and 6: ch 2 (counts as dc here and throughout), skip the first stitch, *dc in the next stitch, hdc in the next 2 stitches, sc in the next stitch, ch 2, skip the next 2 stitches, sc in the next stitch, hdc in the next 2 stitches, dc in the next 2 stitches, tr in the next 2 stitches, dc in the next stitch* across. ending with dc in the next stitch, hdc in the next 2 stitches, sc in the next st, ch 2, skip the next 2 stitches, sc in the next stitch, hdc in the next 2 stitches, dc in the next stitch, dc in the top of the turning ch. Row 7: ch 1, sc in each of the first 5 stitches, *working over the ch-2 spaces, dc in each of the next 2 stitches 3 rows below, sc in each of the next 12 stitches* across, ending with working over the ch-2 space, dc in each of the next 2 stitches 3 rows below, sc in the next 4 stitches, sc in the top of the turning chain. Row 8: ch 1, sc in each stitch across. Join gray yarn with a sl st and return to row 2. Repeat rows 2-8 until you reach your desired length. I repeated them 13 times for a total of 92 rows.